Late last year I was looking for a new appetizer recipe for a party we were having. 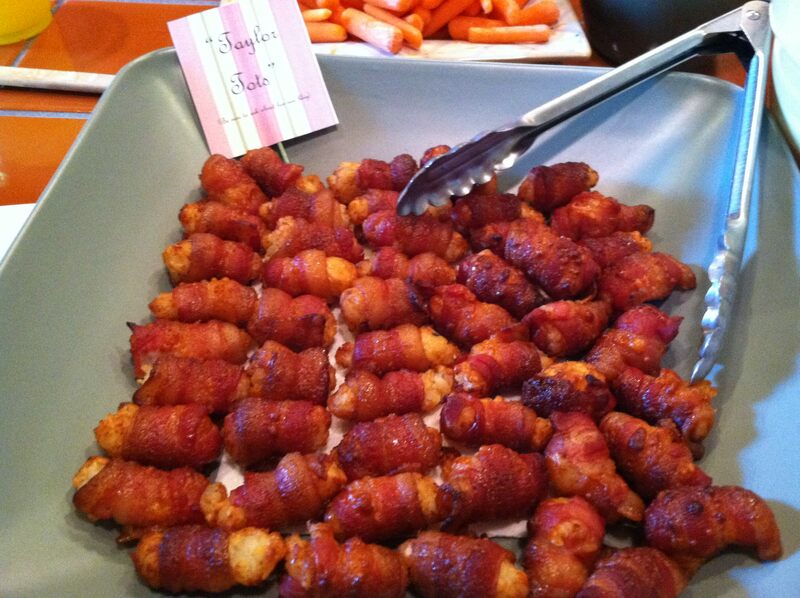 I found one for bacon-wrapped tater tots (insert drool here). It was obviously an instant must try, and perhaps just as obvious was the fact that I had to “Taylor” it with a few special touches of my own. The result: “Taylor Tots” – a hit with every crowd I make them for. I think I made them three different times within the first two weeks, partly because we had several different get togethers during that time and partly because Mike kept requesting them! And he’s not the only one! The husband of a good friend of mine requests these any time I come over. In fact, he’s the reason I made them this weekend for a brunch she was hosting. The appeal definitely starts with the bacon, but once you pop one in your mouth you’re greeted with a symphony of flavors. Salty bacon, sweet and spicy seasoning, smoky provolone or tangy swiss, and the perfect amount of crunch from the tot. Mmm…my mouth is watering already! I may have to cook up a batch as soon as I’m done with this post!! Bacon. Tots. Cheese. What else is there to say?! Oh, did I mention the sweet and spicy seasoning that coats it all?! This makes a large batch, but you'll be glad - there won't be leftovers! Prepare two foil lined baking trays with a rack placed in each. Spray the racks with cooking spray. Set aside. Mix together the brown sugar, seasoning salt, cayenne pepper, and ancho chile powder in a small Tupperware container (so you can save any leftovers). Set aside. Stack several slices of the cheese and cut into strips just slightly less narrow than the tots. Cut the strips in half. Set aside. Start with about half the package of bacon. Pull the bacon slices out of the package and give them a good stretch. This will make them easier to wrap around the tots. Place a tot at one end of the first bacon strip and tightly wrap it and the cheese around the tot. Use your fingers to press the bacon around the tot so it doesn't come unwrapped. Bake for about 30 minutes, or until lightly crisped and caramel brown. You may need to turn the broiler on for the last few minutes to crisp them up. I usually put a small folded paper towel in the bottom of my serving tray before arranging the tots to soak up any extra grease. Make sure to grab some for yourself - they'll be gone before you know it!